Provide Comfort was the huge humanitarian relief operation that assisted the Iraq Kurdish population that had been forced to flee their homelands in northern Iraq for the mountains found along the Turkish-Iraq border region shortly after the Gulf War in early 1991. Shortly after the ceasefire between the Coalition forces and the Iraq forces Saddam Hussein dispatched his army with its feared T-72 main battle tanks and Mi-24 HIND Attack Helicopters northward to deal with the Kurdish rebellion taking place in northern Iraq. U.S. Urges Kurds to Revolt. President Bush had urged the Kurds to support the Coalition in the war effort and to march on Baghdad with their Peshmerga forces. Although the Kurds enjoyed initial success and took much of northern Iraq; they quickly started experiencing defeats at the hands of the superior weapons of the Iraqi Army that was no longer fighting the U.S. led Coalition. Kurds Flee to Border Areas. It didn't take long for a mass exodus of Kurds to leave their homes and flee to the Iranian and Turkish borders. The Iraq military had, on numerous occassions in the past, committed mass murders of innocent Kurd civilians and fears were that this would happen once again. Unfortunately, the Iranians were unable to care for the almost one million refugees crossing its borders. In addition, the Turks refused to allow the Kurds to cross into Turkey. This left over 1/2 million Kurds straddling the border in the high mountains of northern Iraq without shelter, food, or water. Up to 1,000 Kurds were dying daily at the beginning of the refugee crisis. World Attention on Humanitarian Crisis. It did not take long for the world to recognize the problem. The news reports were filled with dire reports of the Kurdish situation. 1. Leaders of European countries (Francois Mitterrand of France,John Major of Britain, and others) were calling the White House saying that something had to be done. The Bush administration could no longer ignore the problem; it had become the news story of the world and the world was waiting for action by the United States. Elements of the 10th Special Forces Group 5. (Airborne), at the time home-based at Fort Devens, Massachusetts (with a battalion forward deployed in Germany), had participated in a very small and secret operation called ELUSIVE CONCEPT. The Special Forces Soldiers conducted Special Operations and Combat Search and Recovery (CSAR) operations during Desert Storm from bases in southern Turkey. The task force was headed by Special Operations Command, Europe (SOCEUR) commanded by General Potter and formed around the Soldiers of 10th Special Forces Group commanded by Colonel William Tangney. This was part of Joint Task Force Proven Force (January - February 1991) staged frin airbases located at Incirlik, Diyarbakir, and Batman, Turkey; with a target area of northern Iraq. As soon as the Gulf War ended the 10th Special Forces Group elements departed Turkey for the states. When Operation Provide Comfort kicked off in early April 1991 the 10th Special Forces Group was one of the first elements on the ground and became (along with SOCEUR) the command and control element (for the first several weeks) for a large number of different military organizations supporting the Kurdish refugee relief effort. 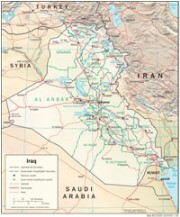 At the conclusion of the Provide Comfort missions a no-fly zone area was enforced over parts of northern Iraq enforced by fighter jets from the U.S. and other participating nations. One unfortunate incident was the downing of two U.S. Black Hawk helicopters mistaken for Iraq aircraft. 2.
International 'Legal Beagles' took issue with the concept of Operation Provide Comfort - taking the stance that the international community should have harbored the estimated 1.8 million Kurds under the 'right to flee'. 3. This, of course, would have been an immense challenge - finding homes and support for that large number of refugees. Turkey certainly was not in favor of this solution. After the end of the humanitarian assistance operation (Provide Comfort) the establishment of a 'no fly zone' provided a level of protection to the Kurds from Iraqi military aircraft. The no fly zone was enforced by Coalition aircraft flying out of Incirlik Airbase in western Turkey for a number of years after the end of the 'original Provide Comfort' mission. These air crews required the presence of a Combat Search and Rescue (CSAR) force that could rescue pilots enforcing the no fly zone over northern Iraq. This CSAR element was provided for a number of years by members (usually company minus strength) of the 10th Special Forces Group (occasionally augmented by ODAs from the 11th Special Forces Group of the US Army Reserves). Operation Provide Comfort. Home of the Psywarrior. Operation Habitat. Australian contribution to Provide Comfort. Wikipedia. Brown, Lt Col Ronald J., Humanitarian Operations in Northern Iraq, 1991: With Marines in Operation Provide Comfort, History and Museums Division, HQs, U.S. Marine Corps, Washington, D.C.
http://www.marines.mil/Portals/59/Publications/Humanitarian Oper . . .
Clary, LtCol David E., Operation Provide Comfort - A Strategic Analysis, Air War College, Maxwell AFB, Alabama, April 1994. Haulman, Daniel L., "Crisis in Iraq: Operation Provide Comfort", Short of War: Major USAF Contingency Operations 1947-1997. An Air Force History and Museaums Program publication, Air Force Historical Studies Office, Joint Base Anacostia Bolling, D.C.
Rudd, Gordon W., Humanitarian Intervention - Assisting the Iraqi Kurds in Operation PROVIDE COMFORT, 1991. United States Department of the Army, Washington, D.C., 2004. USAF, Operation Provide Comfort and Northern Watch, Factsheet, Air Force Historical Studies Office, September 18, 2012. Operation Provide Comfort: Aid to the Kurds, C-SPAN, September 4, 1991. Coverage of testimony before the House Armed Services Defense Policy Panel. LTG John Shalikashvili was commander of Operation Provide Comfort. U.S. Relief Efforts for Kurds in Iraq, C-SPAN, April 23, 1991. Testimony before the House Foreign Affairs Committee on the relief needs for Kurds in northern Iraq. Kurdish Human Rights, C-SPAN, April 8, 1991. Coverage of remarks by the director of the Kurdish Human Rights Watch. Mr. Al-Karadaghi is a former minister in the diplomatic service of Iraq and he spoke on the current plight of the Kurdish minority in the wake of the Persian Gulf War and the ensuing Iraqi civil unrest. July 14, 1991. "UK forces withdraw from Kurdish haven". BBC. 1. For an example of the dire reports on the news about the Kurdish humanitarian situation in early 1991 view a news report by Tom Brokaw, NBC, aired on April 5, 1991. 2. See OPERATION PROVIDE COMFORT: Review of U.S. Air Force Investigation of Black Hawk Fracticide Incident, GAO Report, November 5, 1997. 3. For more on the international perspective of "right to flee" read Safe Havens in Iraq: Operation Provide Comfort, by Sophi Haspeslagh. 4. View a video of a 2nd Battalion, 10th Special Forces CSAR element in Turkey conducting training, September 12, 1991. 5. For info on 10th Special Forces Group view the history, lineage, and description on the USASOC website.